Stagflation - What Does It Mean? 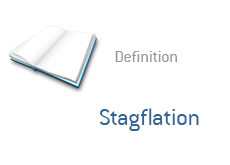 What is "stagflation"? What is the definition of "stagflation"? When has "stagflation" taken place in the past? This is obviously an extremely undesirable combination, as it puts policy-makers in a bind. Do you raise interest rates in order to tame inflation? Rising interest rates makes borrowing money more expensive, which greatly decreases the amount of new business loans, etc. Or do you lower interest rates in order to spur economic growth? By doing this, you are running the risk of having runaway inflation, which can be absolutely ruinous for an economy. The United States faced this exact situation in the late '70s and early '80s. The 1973 oil crisis and 1979 energy crisis had produced a high rate of inflation, while the resulting recession produced a high rate of unemployment in the country. The Fed elected to raise interest rates in order to slow the rate of inflation. These dramatic rate increases put further pressure on the economy, and there wasn't a substantial recovery until 1984.